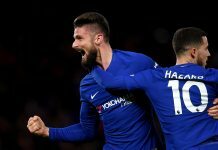 If football is viewed as theatre, then Chelsea certainly have gotten the memo that they need to add the drama, as the Blues came from 2-0 down in the first half to defeat Leicester City 4-2 at the King Power Stadium and will advance to the next round of the EFL Cup. Two goals in extra time from Cesc Fabregas gave the Blues the winning margin and cancelling out two first-half goals from Shinji Okazaki that seemed to spell doom and gloom for the London side. Surely manager Antonio Conte and the Chelsea supporters will welcome the day when victories don’t cause minor heart palpitations, but in the process, this Chelsea side continue to show fight and resilience that wasn’t always present last season. You wouldn’t have guessed that would be the case after watching the first half. If last Friday’s defeat to Liverpool brought back the ghosts of last season’s performances, then the first half against Leicester saw the ghost’s spectre nearly emerge from the coffin to haunt everyone. Aside from poor performances last season, slack defending was a big problem for the Blues, and a quarter-hour in, that defending reared its ugly head. A woeful pass from Marcos Alonso near the halfway line was intercepted by Demarai Gray, and when the ball found its way out wide to Ahmed Musa, things went from bad to worse. Musa’s cross evaded the heads of everyone in the area, but Cesar Azpilicueta’s poor attempt to chest the ball to goalkeeper Asmir Begovic saw the ball loop into the air, and Okazaki was the first to head beyond the flapping arms of Begovic for the opener. Michy Batshuayi should have netted an equaliser 10 minutes later when Pedro’s teasing cross from the left found him unmarked in the six-yard box, but the Belgian striker could only head the ball wide of the mark. Okazaki made the Blues pay for that miss with his second of the game, though he can thank some more poor defending. Gray’s over-hit cross from the left was only half-cleared by Pedro and landed at the feet of Andy King. King’s dinked pass found a brilliant late run by Okazaki, who stabbed home to give the Foxes a deserved 2-0 lead. The Chelsea fight-back started after Leicester showed some defensive weakness of their own. Gary Cahill lost his marker Wes Morgan on a corner, and Cesc Fabregas found him at the back post to send the Blues to the dressing room with a glimmer of hope. Hope sprang eternal just after the break when Azpilicueta produced a stunning volley from 18 yards for the equaliser. A headed clearance from Marcin Wasilewski fell at the feet of the right back, and he lashed it past a helpless Ron-Robert Zieler. 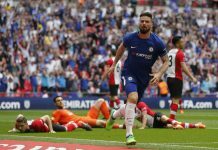 Sensing the match might be there for the taking, Diego Costa entered the fray just after the hour-mark for the ineffective Ruben Loftus-Cheek, and his impact was almost immediately felt. Moments after coming on, Costa knocked the ball down for Batshuayi who uncorked a 25-yard laser that Zieler was able to just get a finger on to push wide. A minute later, Costa caught two Leicester defenders sleeping and latched on to a David Luiz pass, but he fizzed his shot wide when he probably should have scored. Costa, though, made another type of contribution. Wasilewski, who was booked in the first half, was shown a second yellow for barging into Costa with his forearm raised, and Leicester would head into extra time down to 10 men. But it wasn’t Costa who would get the last laugh on the night, that honour would fall to Fabregas. Fabregas, making just his second start this season, showed exactly why he has place in the squad going forward, scoring two goals in the space of four minutes. 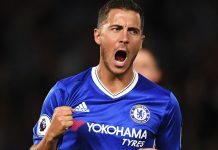 Substitute Eden Hazard’s one-two with Costa sent the Belgian free in the center, and he teed up Fabregas with a back-heel on the edge of the 18-yard box for the midfielder to smash into the top corner to give Chelsea the lead. Then two minutes later, after a short corner, a Hazard cross was deflected into the air. With Costa just in front of him and a group of Leicester defenders surrounding, Zieler could only punch a short distance, but it happened to be straight to Fabregas. Trapping it on his chest, Fabregas let the ball drop onto his left foot before lashing his shot into the roof of the net, prompting an 80-yard sprint to celebrate in front of the travelling fans and giving Chelsea yet another come-from-behind victory.